What a crazy weekend with sales galore! We have decided to make a special deal for our loyal Bliss Studio clients. This special is for Gift Certificates. Purchase a gift certificate THIS WEEKEND ONLY (must be purchased by Sunday Nov.25th at midnight) and receive a 2nd Gift Certificate for the same value for yourself for free! This means purchase a gift certificate for $200.00 for someone and you will get a $200.00 gift certificate for yourself. What a deal! You can purchase any value amount up to $250.00 to get this deal. Please note that the gift certificate you purchase MUST be for someone in a different household. You can not purchase it for yourself or your husband :) This is for GIVING to someone special for no reason at all or a christmas present! And to top it off you get a kick back for yourself. Gift Certificates will expire Dec.31, 2008. Limit one gift certificate per household. Gift Certificates are non-transferable. The gift certificates may only be used for FUTURE orders. You can not use them to pay for orders already placed with Bliss Studio. 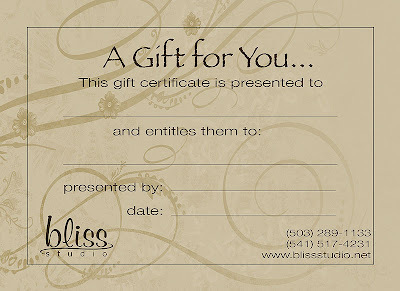 To purchase: Your welcome to email (info@blissstudio.net) or call (541-517-4231) or to make your purchase easy I have put a special "Gift Certificate" gallery on the preview section of our website. Use this link: Gift Certificates...Please note in special instructions who the gift certificate is for.